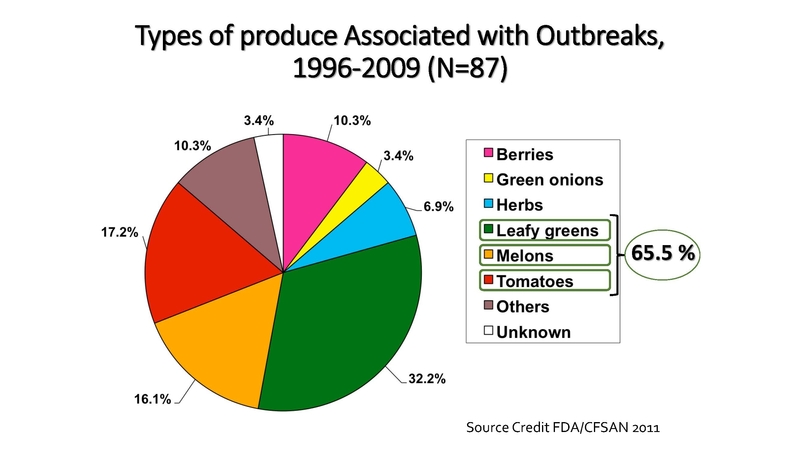 In late September, 2014, the FDA released a modified set of draft regulations for the Food Safety Modernization Act's (FSMA) Produce Rule and the Preventive Controls for Human Food Rule; they had been revised considerably in response to extensive comments submitted by farmers and organizations during 2013. Comments about these revised rules are due to the FDA by December 15, 2014. If you haven't already done so, I encourage you to review the key revisions summarized on the FDA FSMA website (http://www.fda.gov/food/guidanceregulation/fsma/default.htm), as well as my comments below regarding some of the key revisions. You might also want to look at the National Sustainable Agriculture Coalition's excellent review of the FSMA: http://sustainableagriculture.net/fsma/; I reviewed their materials and borrowed some their language for this article. You can submit your comments to the FDA at: http://www.regulations.gov/#!submitComment;D=FDA-2011-N-0921-0973 (for the Produce Rule) and http://www.regulations.gov/#!submitComment;D=FDA-2011-N-0920-1553 (for the Preventive Controls Rule). The FDA has revised its definition of covered farms. It is now proposing that farms or farm mixed-type facilities with average annual gross revenues of $25,000 or less from produce sales will not be covered by the Produce Rule. Originally, the proposed rule related to all farm sales; thus, a small-scale wheat farmer seeking to diversify by growing a few rows of tomatoes would have been covered by the rule. sells the majority of the food directly to “qualified end-users”--consumers, restaurant and retail food establishment (e.g., a grocery store) that is located in the same state as the farm or not more than 275 miles from the farm. Be subject to the provisions regarding the withdrawal of your status as a partially covered (“qualified exempt”) operation; FDA can revoke your “qualified exempt” status in certain circumstances. Dry/dehydrate raw agricultural products, as long as there is no additional processing; and/or label and package raw agricultural products as long as there is no additional processing. Please be aware that the FSMA's terminology is very nuanced. Chopping or slicing fresh produce for sale – like carrots or apples – is considered to be processing, which means that you operate a “facility.” (Certain harvesting activities like trimming outer leaves of produce, or removing stems or husks, are not considered processing.). Washing is considered part of harvesting when done in the field. But, if it is done during the production of fresh-cut produce, for example, it is considered manufacturing or processing. Labeling and packaging are considered manufacturing activities unless you are labeling or packaging a raw agricultural product and are not doing any additional manufacturing or processing to the product. If there is no additional manufacturing or processing, labeling and packaging are considered farm activities and do not trigger the facility definition. However, if these activities are done off of a farm, such as when farms collaborate to have a jointly controlled packing operation, these activities will trigger the manufacturing/processing definition above and would mean that you operate a “facility”. As a facility, the farm would be required to establish and implement hazard analysis and risk-based preventive controls for human food. 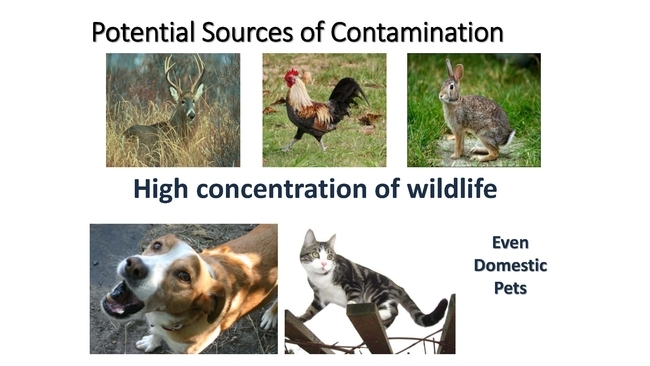 FDA is currently seeking comment on whether the Preventive Rule should require a “facility” to: (a) conduct product testing to verify implementation and effectiveness of preventive controls; (b) conduct environmental monitoring to verify implementation and effectiveness of preventive controls if contamination of a ready-to-eat food with an environmental pathogen is a significant hazard; and (c) require supplier controls when the receiving facility's hazard analysis identifies a significant hazard for a raw material or ingredient, and that hazard is controlled before the facility receives the raw material or ingredient from a supplier. Clearly, these requirements would be considerably more complex and expensive to comply with than the requirements of the Produce Rule for farms. The FDA is proposing various revisions to the microbial standard for water that is directly applied during the growing of produce (other than sprouts). The agency is updating the microbial quality standard to reflect data that supports the EPA's 2012 recreational water quality criteria. For farms that have to test their water, the FDA is proposing three numerical standards below for testing. No detectible E. coli present per 100 ml of water: This standard would apply to water used for an activity during and after harvest, water used to make agricultural teas, and water used in sprout irrigation. 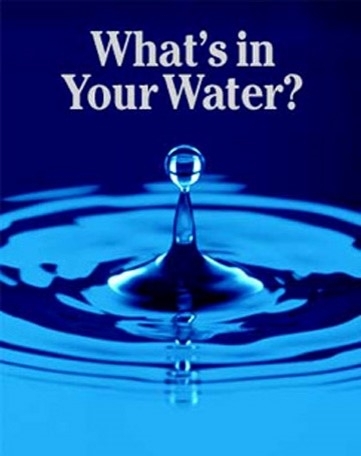 The quality of untreated surface water used for these purposes must be tested from each source of the water “with an adequate frequency to provide reasonable assurances that the water meets the required standard”. You must have adequate scientific data or information to support your testing frequency. Farms using untreated groundwater for purposes that trigger a testing requirement will now have to test their water supply a maximum of 5 times in the first year (4 per year/growing season plus one test per year) rather than testing on a quarterly basis as originally proposed. Their untreated groundwater used to irrigate in a manner that directly contacts the harvestable portion of the crop will have to meet the following standard: a geometric mean of no more than 126 colony forming units (CFUs) per 100 ml. Testing of untreated surface water used for growing produce other than sprouts involving direct contact with the harvestable portion will require the collection of 20 samples over the first 2 years, followed by an annual minimum sampling of 5 per year, rather than monthly or weekly as previously required. The water will have to meet the following standard: a statistical threshold value (STV) of 410 CFUs generic E. coli per 100 ml for a single water sample, and a geometric mean of no more than 126 CFU per 100 ml. If your water testing shows that you exceed these values, you can still use your water, as long as you apply an appropriate time interval between the end of irrigation and harvest as determined by calculating the “microbial die-off”. Numerous organizations and farmers have protested that the FDA's proposed rules would harm wildlife, including forcing farmers to exclude animals from growing areas or destroying animal habitats. The FDA has clarified that its proposed produce rules does not authorize or require farms to take actions that would constitute the taking of a threatened or endangered species in violation of the Endangered Species Act. The FDA had previously proposed a nine-month minimum time interval between the application of untreated soil amendments of animal origin (including raw manure) and harvesting. This requirement conflicted directly with the USDA National Organic Program's standards, which require a 120-day interval between the application of raw manure for crops in contact with the soil and 90 days for crops not in contact with the soil. The FDA now proposed to conduct a risk assessment and extensive research to strengthen scientific support for any future proposal. Additionally, the FDA is proposing to eliminate its previously proposed 45-day minimum application interval for compost. 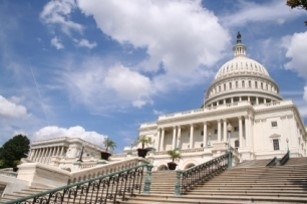 The provisions reviewed above all were improvements over the original FSMA Produce Rule. The revised rules reduced the estimated number of farms in the United States covered by the FSMA by 4,708, of which 2,885 are “very small”. However, some of the provisions still impose disproportionately high compliance costs on smaller-scale farms, as indicated below in Table A. Smaller-scale farms typically have very constrained cash flows. The added expenses to comply with the FSMA makes their cash flows even tighter and reduces their already low level of profitability. If a "very small" farm loses over a fifth of its net cash farm income, this could have significant impacts on its sustainability. And these decreases do not include the one-time capital expenses that a farm may have to incur, such as to modify restrooms or handwashing facilities and to build fences! 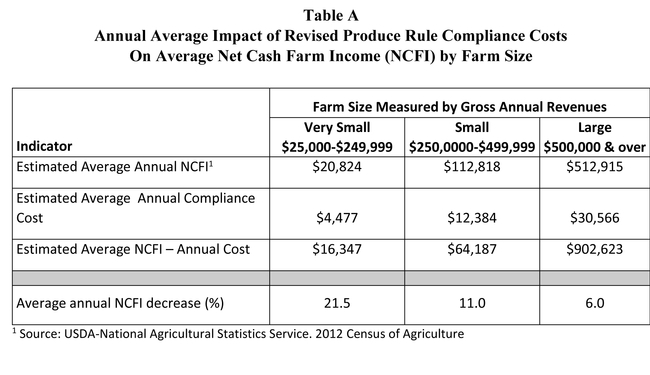 The percentage decrease in net cash farm income attributable to the costs of complying with the FSMA declines as farm size increases. Clearly, there are economies of scale in complying with the FSMA. 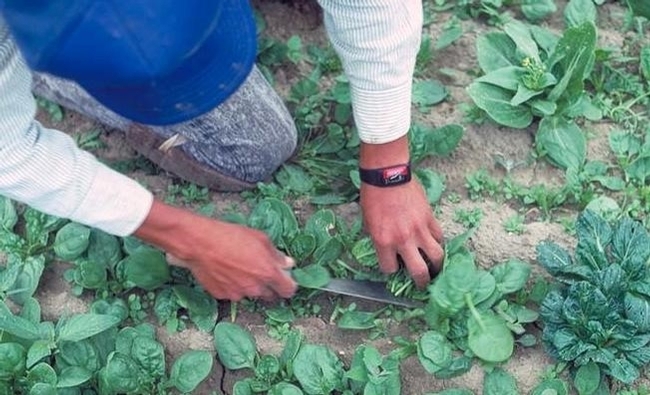 The FSMA includes delayed implementation of FSMA compliance for smaller-scale farms. 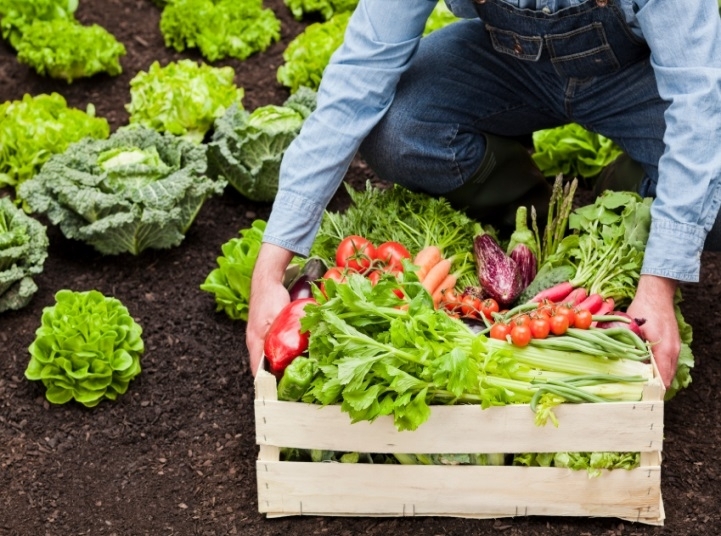 Policymakers should also consider providing subsidies and/or no-interest loans for the capital expenditures smaller-scale farms need to make to comply with the FSMA. Again, please consider submitting comments to the FDA about the proposed FSMA Produce Rule and the Preventive Controls Rule. You can post your comments using the links at the beginning of this article. You can review the FSMA's key revisions summarized on the FDA's FSMA website (http://www.fda.gov/food/guidanceregulation/fsma/default.htm). Also consider reading at least part of the National Sustainable Agriculture Coalition's excellent review of the FSMA.